I’m speaking right before the leader of Portsmouth City Council. This is going to get interesting! 7pm, Thursday, November 22 , 2018, at the Royal Beach Hotel. Clean-air campaigner Tim Sheerman-Chase runs the Let Pompey Breathe blog and a petition for cleanup action at https://greenpompey.org.uk/let-pompey-breathe/petition/ Tim will give us the uncomfortable environmental perspective on our situation, how the city is increasingly choking up, and what consequences we may have to live with. I’m also attending “Air pollution – time for change” with Hampshire Climate Network. Impact of Charging Clean Air Zones: Saviour of Cities or a Red Herring? Given the lack of progress by Portsmouth City Council in addressing air pollution, I began wondering how a Clean Air Zone (CAZ) might be implemented in the city and what effect it might have. There are several types of Clean Air Zones but most interest has been in charging older vehicles that enter busy areas. Since less polluting vehicles attract lesser or no charges, this intended to encourage a shift to less polluting vehicles. This has an impact on residents and businesses that have to replace their vehicles. The revenue from charges is typically invested in sustainable transport. Arguably, this approach does not go far enough. As even the Portsmouth transport cabinet member says, “We simply have too many vehicles in this city“. Punitive prices could be used to quickly force a change in transport usage, but this is hardly going to be popular. It is important to remember that our current transport situation is unsustainable. A significant chunk of pollution is created by diesel cars. To comply with air quality law, these vehicles need to be replaced. The question is how we go about doing that in a fair manner considering many people can barely afford the essentials. Studies have found that the economic benefits to health may outweigh the cost of updating vehicles. The necessity to act has already been established in the High Court and for the benefit of public health. From the options considered, establishing Clean Air Zones (CAZs) is the most effective way to bring the UK into compliance with NO2 concentration levels in the shortest possible time (Table Ex.3). […] CAZs are predicted to have their greatest impact on air quality in the year of implementation […], leading to an 18% reduction in NO2 concentrations. […] These projections have been produced from the SL-PCM model. In German cities reductions in annual mean PM10 and NO2 concentrations up to 7% and 4% respectively due to the implementation of an LEZ have been reported. […] In other countries the picture is much more mixed with no effects [on NO2] generally being observed. This may be explained by the German LEZs restricting passenger cars, particularly diesel cars as well as HDVs. [Heavy Duty Vehicles …] Many of the studies, however, have used simple statistical methods that have not taken sufficient account of the confounding factors that affect urban air quality. This finding is repeated in the London Low Emission Zone, which did not include cars in their scheme and have seen no appreciable drop in NO2. (London has recently started charging older vehicles which might help.) Similar results were seen in the Netherlands. A study of CAZ in Beijing, which only included light duty goods vehicles, predicted a fairly minor drop of 2% in NO2 levels. In summary, Clean Air Zones are only effective in tackling NO2 levels if private cars are included in the charging scheme. This targets diesel cars, which are a major source of pollution in cities. Even if private cars are included, the impact of a charging CAZ may be less than predicted by current modelling. This might be due to different vehicle usage in the UK compared to European cities, but I doubt that is significant enough to account for the discrepancy. Portsmouth needs about a 10% drop in NO2 to come into legal compliance. Given that we need a strong tool to improve air quality, we can look at cities that have banned older diesel vehicles. Older diesel bans are being introduced in some London neighbourhoods, as well as several German cities. We should watch their progress closely to see if improvements can be achieved elsewhere. ClientEarth clean air lawyer Katie Nield said: “Today’s pitiful plan shows that the government’s strategy to tackle air pollution by passing the buck to local authorities is in tatters. It’s essential that the government takes action on a national scale. “Amazingly, ministers have now ordered more plans, which means more delays. It shows a shocking lack of leadership on a key public health issue. This is significant since ClientEarth has repeatedly defeated the govenment in court. Since they strongly criticized the new plan, DEFRA should be extremely worried. ClientEarth could take DEFRA back to court and are quite likely to win. For the sake of public health, the government should take stronger action, including decisive actions taken at a national scale. Ten local authorities have been directed to take further steps to address nitrogen dioxide emissions from road transport, under supplementary plans outlined by ministers today (5 Oct). The councils – Dudley, Leicester, Newcastle-under Lyme, Portsmouth, Reading, Wolverhampton, Sandwell, Solihull, Basingstoke and Deane, and South Gloucestershire – will have access to funding to implement measures including bus retrofits, improved road signalling and behavioural change campaigns. […] Defra has revealed today that eight of these 33 local authorities will carry out more detailed study outlining how they will tackle more persistent air quality problems they have identified, to be presented to government by 31 October 2019. There is a corresponding statement from DEFRA. In it, they announces the new policy document that affects Portsmouth titled “Supplement to the UK plan for tackling roadside nitrogen dioxide concentrations“. In one section, DEFRA provides their view of the recent targeted feasibility study done by Portsmouth City Council. 89. Even with the bus retrofit, there is still a persistent exceedance with compliance projected to be by 2022. The government has therefore also directed Portsmouth City Council to carry out a more detailed study to develop a plan to bring forward compliance in the shortest possible time. The Direction requires that the local authority produce a final plan by 31 October 2019. The bottom of the M275 will come into compliance with legal limits by 2022, according to modelling. However, local modelling shows a rather bleaker picture in the London/Kingston/Fratton Road corridor with no way to know if or when Portsmouth will come into compliance. The DEFRA report also doesn’t mention that the city centre road scheme that is expected to push some areas above the legal limit. 22. For some road links a more persistent exceedance has been identified where the road link is projected to become compliant in 2022 or beyond. For these road links more significant measures could be considered; for example, it is possible that a Clean Air Zone could be implemented. Whilst this measure may not be necessary or appropriate, it is necessary for these local authorities to carry out a much more thorough assessment of the air quality problem and the options available to bring forward compliance. The government has therefore further directed these local authorities to carry out a more detailed study to develop a plan to identify the most suitable measures to address the exceedance. While DEFRA does not insist that a CAZ needs to be implemented, DEFRA now requires “much more thorough assessment of the air quality problem and the options available to bring forward compliance”, which is very welcome. Portsmouth must consider a Clean Air Zone, if they want to claim they did a “through” consideration of “significant measures”. This is what #LetPompeyBreathe has been calling for, for some time, and is one of the measures that has been so far ignored by Portsmouth City Council. The Government is failing to provide clear messaging and national leadership on the issue of charging Clean Air Zones (CAZ). Defra’s technical report found that charging zones offer the fastest and most effective route to air quality improvements, yet the 2017 plan requires councils to demonstrate that all other measures will fail to achieve the necessary results before introducing a charging zone. This lack of clarity is causing confusion and hampering councils’ ability to tackle air pollution as quickly as possible. […] Defra’s modelling already shows that, in many cases, non-charging options will not be as swift or effective as charging Clean Air Zones. If local authorities are regularly exceeding NO2 concentration limits and identify a charging Clean Air Zone as being the most effective mitigation strategy, they should be able to receive Government support for implementing a CAZ without having to go to onerous lengths to demonstrate the inefficacy of other options. If this approach fails to deliver the required improvements as quickly as possible, the Government should consider mandating charging zones in hotspot areas. The measures currently under consideration at PCC are too weak while a CAZ is a known effective solution. Please PCC, take the air quality situation seriously! Update: I just noticed DEFRA has given PCC over a year to produce a plan! That is hardly in line with the urgency of the situation. An initial plan is due by Jan 2019. 2nd Air Quality Steering Group Meet – Is Portsmouth Being Ambitious Enough? I just attended the 2nd Air Quality Steering Group meeting. It had more people in attendance then the inaugural meeting. Councillor Dave Ashmore welcomed everyone and Richard Lee (regulatory service manager) reminded everyone the purpose of the group was to share knowledge and ideas for solving the air quality problem in Portsmouth. They said the “focus points” were addressing the London Road corridor and bottom of M275 AQMA areas. This is already a cause for concern as any very local solution might displace traffic to nearby streets; a more holistic approach may be needed for tackling these two areas. The tone from Richard Lee was the most constructive I’ve heard so far, saying “we need a plan”, that we need to make “difficult decisions” and we need to address the crisis in the “shortest possible time frame”. This is in line with UK law and recent High Court rulings, which is great. The meeting was scheduled to discuss solutions on a shortlist of 12 created by Portsmouth City Council (PCC). Rod Bailey (Milton Neighbourhood Plan) spoke saying we might be missing the bigger picture since new development could easily balance or overtake improvements to transport. We might end up in an even worse place then now, unless this is addressed. Claire Upton-Brown (City Development Manager) then spoke saying the relevant plans are considering air quality and the in-place processes would deal with it. I have my doubts in these assurances since these processes and planning methods led us into the current crisis! PCC shows little sign of realizing they need to do things differently than in the past. Claire also said some planning requests could be refused if they adversely affected air pollution, which was met with skepticism judging by reaction of a few people in the room. (Most likely, PCC will add an aspirational statement in an obscure report about air quality, which is then ignored in planning decisions.) Richard Lee concluded the response to Rod saying we need to improve air quality despite new growth. However, the attitude that we can deal with problems caused by new development at some later time is part of the short term thinking that permeates PCC. Notably, they did not say that new developments have been refocused on reducing pollution, or they had modeled the overall effect of new developments. For this reason, I have little faith that Portsmouth City Council have really understood that development and air quality need to be treated holistically and quantitatively. As far as I know, the polluting city centre road scheme is still going ahead. Instead, we should be considering a halt on development until we can ensure any new development is within the “air quality budget”. We might need to take drastic action now to allow for new developments later. Due to cost, timescales and resources that would be required to set up and run a congestion charging scheme, this would only be considered as a last resort. At this stage, priority is being given to robust measures which will bring about a reduction in air pollution, rather than looking to develop a congestion charge or Clean Air Zone. This is problematic on several levels. Firstly the PCC has a legal requirement to bring air pollution down “as soon as possible” and a charging CAZ is recognized by DEFRA as the most effective means to do it. Any proposal must be at least as effective as a charging CAZ to be legal according to the High Court. A charging CAZ is the benchmark by which other measures are evaluated and therefore should be included as an option an any future plan. Thirdly, saying the timescale of a charging CAZ is too long is nonsensical since without it, it is unlikely Portsmouth will reach compliance within the 2-3 years it would take to implement it. Again, PCC seem to be using wishful thinking to justify half measures. Fourthly, they omit the real reason: political difficulty. People don’t like their routines disrupted. However, we need to constantly remind ourselves that our current lifestyles are not sustainable. Disruption is needed (and inevitable). My first thought is local politicians should just say “it’s the law”, pass the buck to central government, and implement a robust plan. I guess they worry their political positions could be taken by denialists, which is very unfortunate (for all of us). Greening the urban environment to make living streets – missing completely from PCC options list! This was proposed multiple times at the last meeting. A ban on new development unless they are pollution neural or better, at least until a quantitative plan has been produced for air quality. These are the most extreme options but we must think outside the box. Hamburg is banning older diesel cars so it is not without precedent. My biggest concern is the doubt that the 12 priority measures are able to address the problem within a short enough time scale. Local pedestrianization and vehicle limits will just displace the problem. Many other proposals are just tinkering around the edges. PCC should be looking at broader and stronger solutions. Richard Lee said they plan to summarize the feedback they received at the meeting and shortlist about 5 top measures. These will then be modeled and checked for effectiveness before being put into a future air quality plan. Since the other measures have questionable effectiveness, we should include an option known to be effective in the modeling exercise i.e. a city-wide charging CAZ. Without that, I wonder what happens if the modeling report comes back at says none of the measures are ambitious enough? I asked Dave Ashmore how he manages to balance the needs of voters with legal and financial constraints. Without directly answering the question, he implied that (in my interpretation) we need to educate the public to help reach compliance. This is similar to a comment by Lynn Stagg (at the first meeting) that we need to “bring the public along with us” rather than force them along the right path. I disagree since this is a public health crisis that needs to be urgently addressed. Educating the public about air pollution will take 5-10 years at least (and has already been tried with little success), while we need a solution in 2-3 years. Some compulsion will probably be needed. One thing that was not discussed was DEFRA’s instructions about need for a Targeted Feasibility Plan, what PCC has sent as a response and what the next stage in the process might be. I am concerned (along with Mike and Rod) that DEFRA is distracting PCC by focusing on just the M275 rather than London Road and overall the big picture. In conclusion, I welcome the clear language and direction Richard Lee used in introducing the issues but I am concerned that the measures under consideration are too weak. Southampton is planning to introduce a charging Clean Air Zone (CAZ) in an effort to reduce air pollution. This is generally accepted to be the fastest and most reliable method to improve air quality. However, the Isle of Wight council has objected to the plans saying it would badly affect manufacturing and tourism. This is a tricky problem because Southampton is one of the main routes to the Isle of Wight. If the charges go into effect, the cost will eventually be imposed on consumers and tourists. However, the people of Southampton (and Portsmouth) are exposed to traffic fumes, mainly from diesel cars and HGVs, of people traveling to the ferry terminal. Shipping itself also worsens air pollution, although Wightlink has just introduced a hybrid power ferry for the Portsmouth route. I think what is important to remember is that the status quo is not sustainable. We can’t have tens of thousands of people (UK wide) dying each year from preventable causes. Yes, jobs may be lost but people will shop and do leisure activities more locally, which will create different jobs. Also, the money generated from the CAZ should be (will be?) used to subsidize public transport, which will make getting around easier and more sustainable. A problem for Portsmouth residents is that the most polluting vehicles will be threatened with the biggest charges, and be most incentivized to find another route. The most obvious route at this time is via Portsmouth. 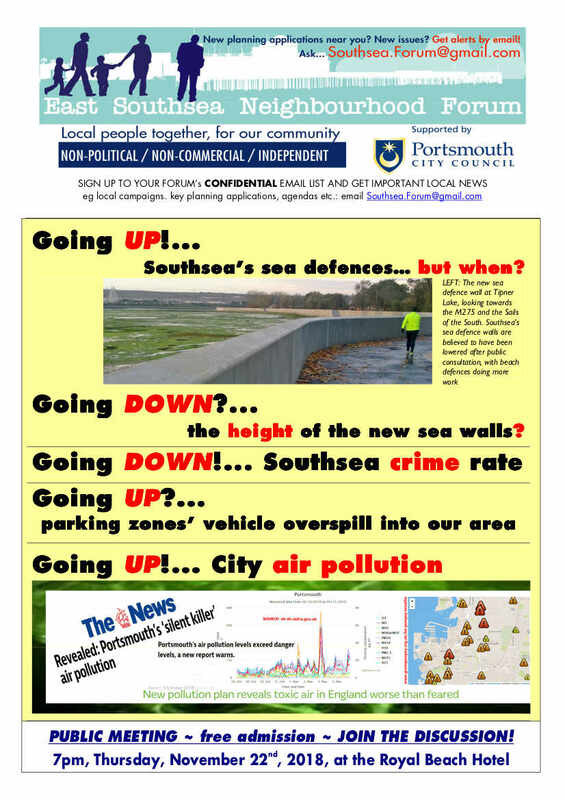 So we might be seeing the quantity of the most polluting vehicles increase in Portsmouth because of the Southampton clean air zone! This effect is called “displacement”. What we need is a charging CAZ in Portsmouth as well, to balance the scales. In the long term, ferry ports constructed within major cities might need to be relocated (or existing ferries need to be low emission and only take cargo/passengers moved sustainably). PS. 19th September, I’m going to the second air quality steering group at PCC. What does the Annual Air Quality Limit Actually Cover? All locations where members of the public might be regularly exposed. Building façades of residential properties, schools, hospitals, care homes etc. Building façades of offices or other places of work where members of the public do not have regular access. Hotels, unless people live there as their permanent residence. It states the annual mean should be applied at “All locations where members of the public might be regularly exposed.” The first curious issue is the limit only applies to members of the public. People at a place of work are not being protected, based on the DEFRA guidelines, even though a considerable amount of time is spent in the workplace. This is perhaps because DEFRA can’t control local pollution sources within the workplace. However, in an office environment, most pollution probably blows in from outside. The second strangeness is the examples seem to include most places of residence (+ hospitals and schools), but exclude (in practice) just about every other building. Parks, libraries, community centres, churches, beaches, sports grounds and universities are not necessarily included and Portsmouth City Council have not sited any detectors at these locations. This seems to be a serious omission because people, particularly children, can spend a significant time at these locations. This seems to be part of the council’s strategy: to redirect traffic from residential areas and through commercial zones. This is particularly bad for the University of Portsmouth which will see a significant increase in pollution after the City Centre Road scheme road capacity upgrade. On the other hand, other air quality objectives apply at these sites which might be more appropriate. However, the council has a much weaker monitoring system for these short term limits. With this in mind, they might want to rigorously apply the annual standard since that is what they are capable of monitoring on a large scale. The guidelines begin with “All locations where members of the public might be regularly exposed.” The “regular” exposure could be interpreted as being exposed at regular or frequent intervals of time i.e. daily or weekly, including short exposures. However, local authorities seem to be interpreting this as “All locations where members of the public might have significant exposure.” This has some sense because the air quality limit is an annual mean and any exposure of a few minutes is not going to make much difference. However, some locations have the public stay regularly for hours, and would contribute several hours of exposure a week. This is a significant exposure and the annual mean should be applied. Of particular concern are parks and community centres which have younger, more pollution sensitive people regularly visiting. I am concerned about Victoria Park which is surrounded by busy roads. I’ve also heard concerns about Hilsea Jubilee Splash Pool near the Portsbridge roundabout. Portsmouth City Council needs to take air pollution seriously, including controlling dangerous levels around the University of Portsmouth, Victoria Park, St Agatha’s church, St John’s Cathedral since the public has regular exposure to air pollution at these locations. Let Pompey Breathe was invited to the first meeting of Portsmouth Air Quality Steering Group. Created by Portsmouth City Council to collect feedback on the air quality situation, it includes community groups, transport managers and PCC planners. Cabinet member members for environment and transport were also there. They aim to share local knowledge and contribute to the next air quality action plan. The compliance manager Richard Lee even said PCC aims to go beyond just reaching compliance and do continual improvement of air quality. This is very welcome it I am concerned that the political will to achieve this is lacking. The 2017 ASR results indicate that NO2 have exceeded the NAQO at 3 locations with in AQMA6 during 2017. No other exceedances of the NAQO, in any pollutant, have occurred. This seems to ignore site 116 at the Catholic Cathedral on Alfred Road! In 2017, this site recorded 42.6 ug/m3, which is above the legal limit. Ignore data makes it seem like PCC is still in denial about the scale of the problem. 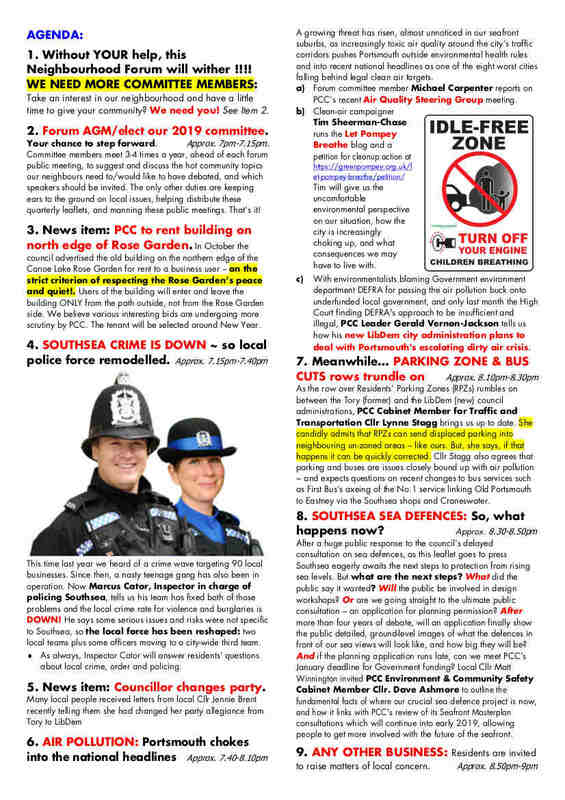 UPDATE 27th July: PCC told me that this sites does not count because it is not a site “where members of the public might be regularly exposed” under the DEFRA guidance. In discussions, either a holistic or focused approach could be used. The worst pollution is concentrated in a few areas, such as the bottom of Mile End Road, and the London Road corridor. The trouble with the focused approach is the causes and potential solutions involve the entire city. Some approaches can easily displace traffic from one neighbourhood to another. Also, the council seem to be focused too much on compliance in the worst areas, rather than trying to improve public health city wide. In response to the High Court telling DEFRA to improve their air quality plan, they have asked Portsmouth City Council to perform a “Targeted Feasibility Study” to quickly reduce air pollution. DEFRA has strangely told PCC to focus on the Mile End Road area, which is odd since measured pollution is worse along London Road. PCC said DEFRA found Mile End Road is an area of concern based on computer modelling based on the EU’s Pollution Climate Model. It is rather strange that DEFRA is focusing on an area which seems to be (just) within compliance while ignoring an area that is above the legal pollution limit. This is particularly worrying since government funding often follows DEFRA guidance. DEFRA needs to be clear on how their plan will get PCC to achieve compliance in all areas by 2020/2021. On the other hand, perhaps PCC monitoring along Mile End Road is deficient and there may be a pollution black spot that has remained undetected. The continuous monitoring station on Mile End Road (near Charles Dickens birthplace) is adjacent to a bus lane, which means the data is not acceptable by DEFRA. Apparently DEFRA is not asking for a Clean Air Zone (CAZ) at this time, which makes it difficult for PCC to reach compliance as soon as possible. It is unclear if the city centre road (CCR) scheme has been included in the DEFRA models, but it seems like they rely on national data, which is only approximate. Also, the model is apparently in 1km grid, which is relatively low resolution. DEFRA is concentrating on Mile End Road but it is only 500-800 metres from London Road. They seem to be focusing resources based on a model that can’t distinguish between these two areas. The recent air quality grant to PCC will apparently fund a Portsmouth Clean Air Network. This will invite people to sign a pledge to improve air quality and will keep people informed of developments. This somewhat overlaps the mission of the blog but we welcome constructive competition! The meeting split into three groups to discuss ideas for specific areas around the city. I raised the possibility of a city wide CAZ. We discussed ways to change people’s attitude to air quality measures. Putting adverts on Colas vehicles was suggested. Lynne Stagg thought it was appropriate to put messages to encourage people to use sustainable transport. I suggested using stronger language because of the national health emergency. Lynne Stagg said that would risk a panic and we should win hearts and minds to bring people along with PCC. I think that attitude is rather over-reacting, and the public needs to be better informed about the health risks they face. I mentioned the problems with the city centre road scheme and how it increased pollution overall city wide. Lynne Stagg seemed surprised by this claim, which is worrying since she manages transport for the city. She emphasised that traffic will flow will improve in some areas, which is true. I pointed out the overall impact is still negative. The steering group plans to meet again in several weeks, with the air quality action plan being published by PCC by the end of the year. In short, it is good that PCC is listening to feedback. However, the PCC councillors don’t seem to recognize their legal obligations or how current plans are vague and insufficient. It is also worrying that DEFRA seems to be distracting from addressing the area of most concern. They need to help focus PCC’s attention on rapid effective solutions rather than distract efforts to less important matters. PS One major issue we need to resolve is how do we measure if PCC is in compliance with air quality laws: using modelled or measured pollution levels? 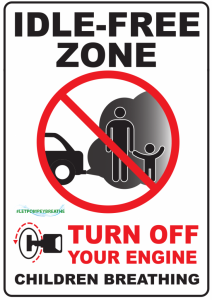 Tracey designed these rather awesome anti-idling signs for use outside schools. This is to encourage parents doing their school run to switch off their engines while waiting. This should reduce pollution for children (and adults!) entering and leaving the school gates.